The author of 10% Happier is back with his second book, which is part-memoir and part advice. After his first book, he set out on a bus trip around the country with his friend and fellow meditation guru Jeff Warren, meeting people and spreading the word about meditation. The advice part of the book is organized by various reasons for not meditating. In each chapter that reason is examined and advice is given on how to get around it. They range from not having time to "people might thing I'm weird." It's filled with stories of people Harris and Warren met, their concerns about meditation, and the practical suggestions about how to make it work. I liked the stories about everyone he met along his tour and how they were using meditation in their lives. From prisoners to police, it seems like many people are turning to meditation to quiet their minds, strengthen their focus, and help them be a little bit better at whatever they do. The book also contains lots of wisdom that I'm going to try to remember. For instance: "Getting lost and starting over is not failing at meditation, it is succeeding." I also really like the concept of the "second arrow": when someone hurts us, that is the first arrow, but we often compound the wound by our self-pitying secondary stories of how we didn't deserve it, how this stuff always happens to us, how this injury will ruin everything, etc. We'd be less hurt if we didn't add insult to our own injury. And of course there are helpful tips about making meditation part of your life. I especially like the encouragement to do it regardless of how little time you can spare: if you only have a minute, then meditate for a minute. Harris is a bit judgy about traditional meditation. It's nice to point out that you don't have to sit on a special cushion listening to pan flute - and I think it's super important to let people know this - but there's also nothing wrong with it. (I'll admit I like the pan flute.) 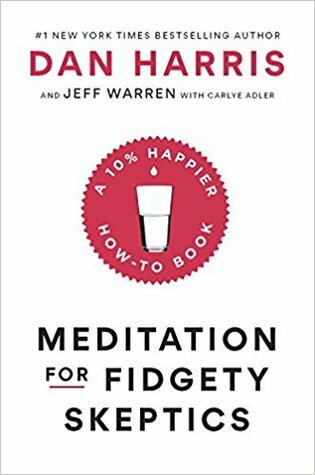 I like how practical their advice is, and how Jeff uses regular language in his meditations, with no mystical flourishes. I think this guide is very accessible to the general population in a way that most meditation books aren't. Personally I wished the ratio was a little more story and less advice. As much as I want and appreciate meditation advice, I find it a little boring to read about. I could also have easily skipped reading the meditations, but I'm too curious. This isn't a criticism of the book so much as a commentary on what I personally like to read. Ok, I'll criticize one thing (in addition to his being judgy) and that's how he brings up his wife so much as a critic of his behavior and habits. I mean, I think he's actually very grateful to her support and appreciates her feedback but it came off a little stereotypically male in that my-wife-is-always-nagging-me kind of way (though to be clear he definitely never said that.) But that was very minor. So how does it differ from Dan Harris's first book? That one was definitely heavier on the memoir aspect as it really delved into his personal journey with meditation. Though he explained how to meditate and did a little myth-busting, this book is where he really gets into the thick of it. 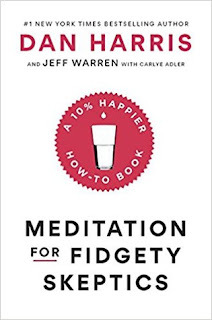 As I mentioned, there are several guided meditations included, and the the bulk of the book was focused on addressing many common reasons why people resist meditating even if they know it will be beneficial. So he spends a good amount of time talking about how to fit it into a busy schedule and make it a habit, which is pretty valuable. All in all, I think the two books complement each other quite well. This sounds like a good book. Your review made me want to read it so I just placed a hold on this book at the library!